Have you heard of : Hacienda Chicago Esmeralda, E. Helena, El Injerto, Fazenda Santa Ines, Hawai Kona……………..
Sure you have heard of ‘Punugu poonai’ – the civet cat. It is not exactly a cat but a small nocturnal mammal that lives in forests. 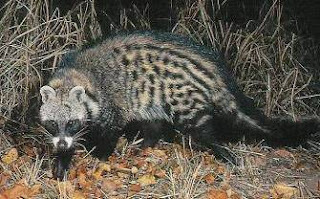 The word civet also refers to the distinctive musky scent produced by the animals. 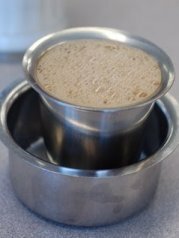 South Indians are so fond of coffee that their mornings begin with a big tumbler of coffee taken hot in the morning. Not ordinary Coffee, but Filter coffee – made from decoction dripping down from coffee powder made of dark roasted coffee beans, chicory – the hot water percolates through the thick powder solely by gravity and not under pressure. To this decoction, is added milk, enough not to change the colour and aura. The fresh coffee beverage literally wakes you up and makes you open to the day’s realities. It has a stimulating effect on people due to its caffeine content and is the most consumed beverages of the World. Your nearby restaurant may charge Rs.25/- for Coffee and in a Star hotel, you might end up paying in hundreds and costlier if you are to order in a trendy Coffee club but can you imagine paying closer to Rs.6000/- for a cup of coffee ! Read this on. - yes, it is Kopi Luwak coffee, which is produced on the Indonesian island of Sumatra, made from animal droppings. The beans are extracted from the droppings of the native palm civet — a cat-like creature that eats only the ripest coffee cherries - but can’t digest the hard centres. They digest the fruit pulp and excrete the beans on to the forest floor. The droppings, combined with the animal’s gastric juices, are said to be the key to the coffee’s rich, frothy flavour. The beans are extremely rare and only around 450lb per year are harvested. Exactly seven grams are weighed out before being brewed and poured into a heated coffee cup, which helps form a frothy layer on top. The coffee is to go on sale at new venue DSTRKT, near London’s Piccadilly. So, next time you are in London do try out this coffee though the price appears to be a bit far expensive. PS : the names mentioned in the first line of the Post are some of the exotic coffees sold across the World. Ps 1: made on 9th Jan 2012 and posted now.